Urban Simplicity: What's on your bar? As this is an ad free blog I generally do not offer product reviews here. Believe-it-or-not I get propositioned for this relatively frequently, but I generally review products on other sites and publications, not this one (someone recently emailed me and said they really like the feel of my blog and wondered if I would post my thoughts--for payment--on their car-related item with links...ummm, did you even look through the blog, I emailed in return). No response. But when I was contacted by someone at Bike2Power to review a handlebar mounted iPhone case I thought that I would do it for a couple reasons. The first is that, this being my blog and I do not have an editor or advertisement requirements, I could truly say what I felt about it. But also, and this is most important, is that this really does relate to this blog and hopefully it may interest some of the readers. I was--and still am--excited to have received this item as I have thought about a phone mount for a while but haven't got around to getting one. (I'd be interested in hearing if others use a phone mount, and if so, what apps you use). Anyhow, I've had my phone strapped to my handlebars for nearly a week now, and here are a few thoughts (I won't bore you with too many details). Super easy installation. It comes with its own Allen wrench and fits the handlebars as easily as any simple blinky light would...wrap the plastic around and tighten down. 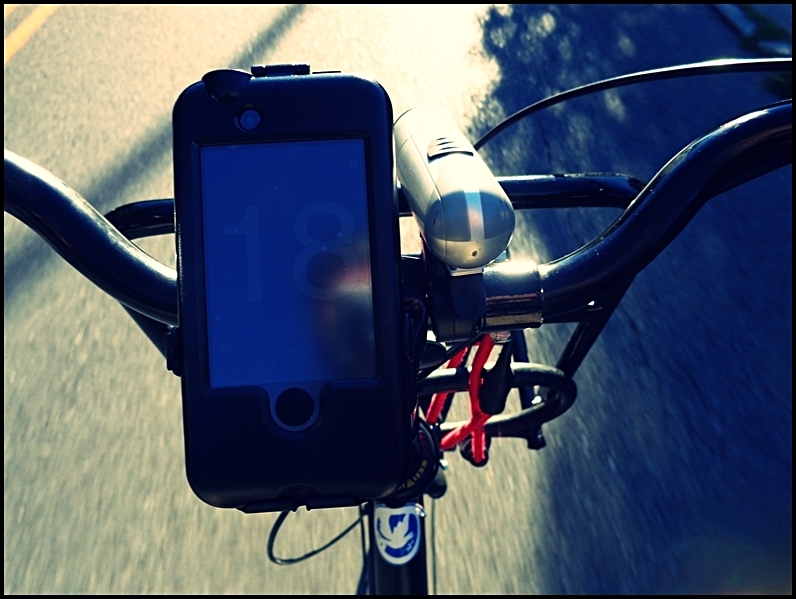 The mount, or at least most of it (more on that in a minute) remains on the bike, and the phone easily slides on or off with a quick-release lever. 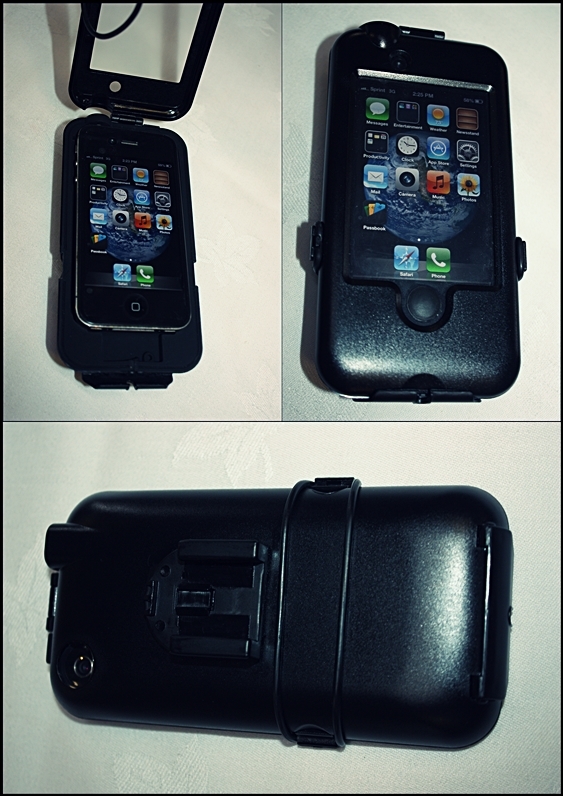 The phone itself fits perfectly...nice and snug so it doesn't rattle around when riding. The mount swivels so you can use the phone vertically or horizontally. The camera, touch screen, phone, and on-off switch matched perfectly to the phone and worked well. It's fun using GPS and a speedometer app; I also used it to shoot a short video while riding through traffic. A few things I don't like about it. In order to charge the phone it has to be removed from the case. There is a space to charge it within the case but it still needs to be opened up...if this were to be my "everyday case" I would not want to have to open or remove it from the case daily. Yes, this may be petty, but for me it's a reality. There is no access to volume controls. The phone is listed as "weatherproof," and I think this can be misleading. Weatherproof is too nebulous of a word and may give some a false sense of security. I did not submerge it in water (or even get it wet yet) but I did open the headphone access and blew air threw it and air escaped around much of the seal (my view is that if air can escape water can get in). I am writing from, and ride year-round in, Buffalo, New York, where we are known for our sometimes harsh winters. This winter will be the test to see if it is truly weatherproof. To see this case at Bike2Power's site, click here. If you have this case or another (or if you've hacked your own handlebar contraption...which I've considered) I'd love to hear your thoughts.